To understand many subcellular psychobiology problems (and certain peak states of consciousness) requires an understanding of the Papez-MacLean discovery of the triune structure of the brain. In particular, the work of Dr. Paul MacLean of the US National Institute for Mental Health is key to our understanding. This material is covered in depth in Peak States of Consciousness, Volumes 1 and 2, so we will only emphasize the highlights here. In our culture, we're accustomed to recognizing that we have a body, heart and mind - the familiar source of sensations, emotions, and thoughts. In evolutionary biology, these parts of our self are due to separate brain structures known as the reptilian, mammalian, and primate brains. What isn't widely known is that these brain structures are self-aware, they 'think', and have a particular viewpoint and agenda. However, their 'thinking' processes radically differ. The body (reptilian brain) thinks in sequences of sensations, and makes decisions based on associations of sensations; its primary drive is survival and reproduction. The heart (mammalian brain) thinks in sequences of emotions, and its primary drive is connection. The mind (primate brain) thinks in sequences of words or thoughts, uses judgment, and understanding is its primary drive. Each brain usually experiences itself in a physical area of the body: the body brain in the lower belly, the heart brain in the chest, and the mind brain in the head. The triune brains are the basis of the 'subconscious' mind in psychology. For most people, these brains awarenesses are separate from each other, and in fact compete to dominate each other. Dysfunctional family dynamics mimic the internal interactions between these brain awarenesses. A large class of peak states, called as a group as triune brain fusion states, exist because it is possible for these brain awarenesses to fully merge with each other in various combinations and degree. Having all of the brain structures' awarenesses fully fused together is optimum, and in fact is how we were designed to live. When this occurs, the composite brain awareness location becomes shifted. The full fusion state finds the awarenesses experiencing themselves in the upper belly area. There are four other, less well known brain structures. One is the solar plexus brain. It awareness is usually found tightly coupled with the body awareness, and so most people are unaware of it as a separate entity. Its primary mode is the sensation of movement, and its primary drive is also survival. Another is what we call the crown brain. Its awareness is usually found tightly coupled with the mind brain, and so most people are unaware of it as a separate entity. Its awareness is usually located above the head, and its primary drive involves the body's physical structure. The last four brain structures require an understanding of cellular evolution, described in the next section. When we normally think of brain structures, we think of large masses of neuron cells in the head. Although there are large amounts of brain type cells elsewhere in the body, particularly the lower belly and heart area, the model that the brain is in the head is quite useful and matches most clinical experience. However, the next two brain structures are not as obvious as the previous five. One of them has its awareness in the belly button area, and the other in the spinal area centered in the upper trunk of the body, ranging from the center of the back to the throat. To understand them, we turn to developmental biology. From an evolutionary standpoint, the multi-celled structures we call organs (be they brain structures or other internal organs) are an extension and elaboration of subcellular structures, called organelles, found in our remote single-celled ancestors. When we evolved into multicellular creatures, nature used the original organelle as a template and just reproduced the same function more efficiently using many cells. This simple model makes sense; but the next jump in understanding is not as intuitive. Techniques using intentional or accidental regression to early sperm and egg trauma uncovered a totally unexpected fact - the prototype precellular organelle brain structures in the sperm and egg are also self-aware! They feel, sense, think, and act in exactly the same way that they do in the adult body, given the constraints of their cellular existence. In fact, self-awareness starts before the formation of the primordial germ cell, and continues without break through development into the adult brain structures. For most people, the organelle (triune brain) awarenesses are usually fused together into one single ‘cellular’ consciousness until birth. At that time, for most people these awarenesses split apart into the situation that we experience as adults. Worse, for most people, most peak states are lost during birth, and so most people experience adult consciousness life in a very disabled and partial manner, quite differently than it should be experienced. With this explanation, another two self-aware paired 'brains' can be identified. They start as equivalent structures in the primordial germ cells, although their functions differ depending on whether they are in the egg or sperm. The one that experiences itself in the upper back at the spinal cord after birth starts as the sperm tail. After conception, this precellular 'brain' is shifted into the developing zygote. We call this brain simply the ‘spine’ or 'sperm tail' brain (depending on context). 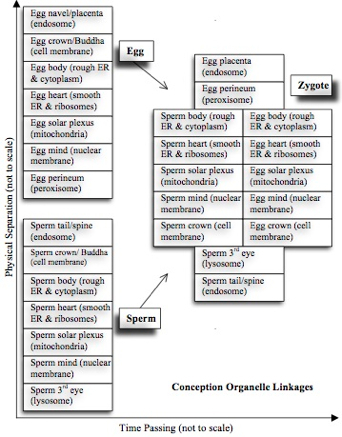 The equivalent self-aware brain structure in the egg develops into the placenta, and it is experienced at the front surface of the belly area after birth. We call this the ‘navel’ or ‘placenta’ brain, depending on context. Like the sperm tail, after its womb function is over it shifts its awareness into the baby. At first glance, one would expect that these brains would have no influence on adults. However, this is far from the truth - they are intimately involved with the feeling and state of 'wholeness'. Two more paired ‘brain’s’ exist. They are also equivalent structures in the primordial germ cells, although again their functions differ depending on whether they are in the egg or the sperm. They are both involved with structural issues, and create problems involving generational traumas. One of them becomes the perineum brain, so-called because its awareness is in the perineum for most people. The other becomes the third eye, and its awareness is experienced in the head. 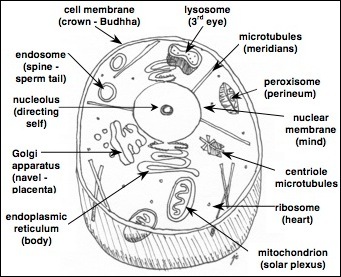 To sum up, our physical bodies are composed of 14 separate, self-aware brain structures that are an elaboration of subcellular organelle structures in the sperm and egg. Seven are from the egg, and seven from the sperm. At conception, some of them physically pair up, while others do not, forming a total of nine structures (five pairs and four singletons). In average people, the individual triune brain awarenesses are to one degree or another separate from each other. The brain awarenesses can give up their individual identities and merge or fuse together to form single awarenesses. The different possible ways that the brains can 'merge' results in different peak states with distinctly different experiential characteristics. The Happiness, Inner Peace, Hollow, and Wholeness states are examples of different brain awareness combinations. As a group, we call these states 'triune brain fusion states'. Perry diagrams can be used to show the different ways and amounts that the awarenesses are merging. These diagrams allow clinicians to identity the types and degrees of the triune brain states a client has, in order to keep track of progress in fully acquiring the endpoint states, Hollow and Wholeness. Volume 1 of Peak States of Consciousness goes into these states in great detail. Triune brain fusion states and probably other states as well can and often are temporarily lost during the time the pre-birth injury is actually occurring. The phrase, "Every man for themselves!" captures the situation between the triune brains at that moment quite well. However, the loss of states isn't permanent, and they soon return after the trauma ends. Alternately, the triune brain fusion state can also be recovered at that particular moment by fully healing the trauma. Previously, we identified the triune brains as being self aware. However, with some introspection, it quickly becomes apparent that there is something missing in the model - where is the ‘who’ that is aware of the brains' feelings and actions? In other words, if the triune brain model is correct, why doesn’t it match our everyday experience? True, we have thoughts, feelings, and body sensations that correspond to the triune brains, but doesn’t the Western model of a single awareness with a conscious (and unconscious) fit our typical perception of ourselves better? Even if the triune model is true, isn’t our seat of awareness behind our eyes in the neocortex? To understand the answer, we need to add another element to the triune brain model. This element is the 'conscious self'. I'm referring here to something that is totally familiar to us, as it is the core of our moment to moment perception of ourselves, the ‘conscious mind’ in Western terms. The triune brain model requires the addition of another element, the 'conscious self', so that one can understand and explain certain types of experiences encountered in key developmental moments. Even more importantly from a practical perspective, this element is required in our processes for healing some diseases or acquiring many of the peak states. However, unlike the vague definitions of this concept found in psychology, in our work we use a clear, unambiguous experiential identifier. We will show a way that people can point at the concept and recognize it from their own personal experience. We call this new element of the model the ‘center of awareness’ of the conscious self, or 'CoA' for brevity. A very simple test is quite revealing about this phenomenon. Take your hand, and point a finger at yourself, starting slightly above your head. Slowly move your finger down your body until it feels like you're pointing at yourself, at your center of your awareness. By this I mean, point at where "you" are in your body. Continue moving your finger downward and notice how it eventually feels like you are no longer pointing at where you are in your body. Because mine is usually behind my eyes, I just assumed this was true for everyone. This is not the case, as Dr. Pellicer of our Institute discovered when she ran a test on our workshop participants to see if it was. Instead, having the CoA in the head is found less than half the time. In fact, the center of awareness can be focused in a spot from the head to belly, it can be split into two locations, it can be spread out in an area, it can be outside the body, or it can even be uniformly distributed throughout the body. Interestingly, there is a physical, subcellular biological substrate for the CoA, but this topic is beyond the scope of this article. This is the area of the body, or outside our body, where we experience our center of self awareness. This is the place where we can point a finger and locate where 'we' are in our body. It can be in one spot, diffused over an area, or completely fill the body. We define the 'conscious self' experientially. It is what we refer to when we point at the physical center of our self awareness. It has a physical basis that is quite different from the biology of the triune brains. This is in contrast to the individual awarenesses of the individual (or fused) triune brains, which may or may not be experienced from the viewpoint of the center of awareness 'self'. In this text, we often refer to the conscious self as the CoA for clarity. Other terms in the literature for this concept are 'soul', 'spirit', and 'self-awareness'. Elaine De Beauport, The Three Faces of the Mind: Developing your Mental, Emotional, and Behavioral Intelligence, Quest Books, 1996. Tom Brown, Jr., The Vision, Berkley, 1988. Tom Brown, Jr., Grandfather, Berkley, 1993. Ronald Gross, Peak Learning: A Master Course in Learning How to Learn, Tarcher, 1991. Dr. Arthur Janov, The Anatomy of Mental Illness: The Scientific Basis of Primal Therapy, Berkley, 1977. Dr. Arthur Janov, The New Primal Scream: Primal Therapy 20 Years On, Trafalgar Square, 2000. Dr. Thomas Lewis, Dr. Fari Amini, and Dr. Richard Lannon, A General Theory of Love, Random House, 2000. 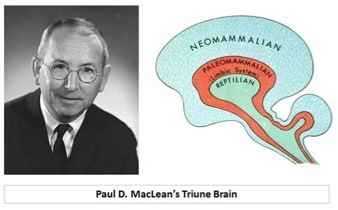 Dr. Paul MacLean, The Triune Brain in Evolution: Role in Paleocerebral Functions, Plenum Press: 1990. Dr. Grant McFetridge, Peak States of Consciousness, Volume 1, 2004. Dr. Grant McFetridge, Peak States of Consciousness, Volume 2, 2008. Joseph Chilton Pierce, Evolution's End: Claiming the Potential of Our Intelligence, HarperCollins, 1992. Joseph Chilton Pierce, The Biology of Transcendence: A Blueprint of the Human Spirit, Inner Traditions, 2002. David Hartman and Diane Zimberoff, "Deintegrate, Disintegrate, Unintegrate: a Buddhist Perspective in Heart-Centered Therapies", Journal of Heart Centered Therapies, Autumn, 2003. Thich Minh Thanh, The Mind in Early Buddhism, Munshirm Manoharlal Pub, 2001. 2.0 Nov 19, 2014: Moved the organelle information on the peak states page to the subcellular psychobiology section. Minor editing. 1.1 Nov 20, 2009: Revised the text on the triune brains to include the perineum and third eye organelles. 1.0 2005: Revised the text to eliminate references to Volume 2, as it did not reflect the final published version.